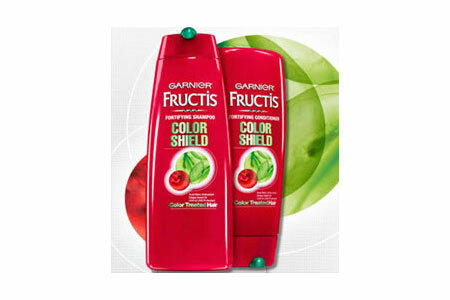 Garnier Fructis's new product line for color users. Specially formulated for color-treated hair, to stop dry out and fight fade out, even after 45 washes. Acai berry and grapeseed oil keep color bold and brilliant, hair silky and soft. It's proven to perform. I received some and immediately decided now was a good time to cover the grey. And it was a good time, let me tell you. Another 56 hours later and I was ready to wash for the first time. (Color users know you have to let it set 48 hours before washing.) I always anticipate some color still rinsing or coming out in the first wash, even though I thoroughly rinse the color. It is really depending on what shampoo you use I find. Using this product, I have no color in my rinse. When I toweled my hair, the towel was clean and free of any trace of color. I then checked the hair to make sure no grey all of a sudden became visible, and voila, it was good too! I used to use Tresemme for colored hair, and was not completely satisfied. I am making the switch to Garnier today! Recommend? Yes, for color users. DISCLAIMER: I received a sample for review. I was not compensated for my opinion or this post. I have never tried it but I will the next time I cover the grays! Thanks for the review.